Fans of cosplay dress up as their favorite fictional characters for a meetup at Uwajimaya. We caught it on camera. Cosplay is nothing new in Portland (the word comes from the combination of “costume” and “play” and refers to people dressing up as characters from TV shows, comics, and video games). 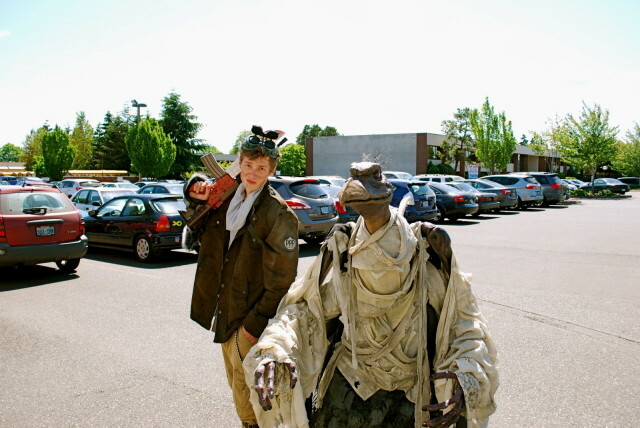 We don’t have anything on the scale of San Diego’s Comic Con, but it’s not exactly unusual to see a couple of Jedi Knights, say, shopping at New Seasons on a given Saturday morning. But when we heard that there was going to be a Cosplay event happening at the Asian supermarket behemoth Uwajimaya in Beaverton, it turned more than a few heads. Was it a promotional event, given the prevalence of Manga characters among cosplayers? Would there be Storm Troopers stalking the rice cooker aisles searching for something that would work in the Death Star mess hall? Random? Yes. But kind of perfect, too. 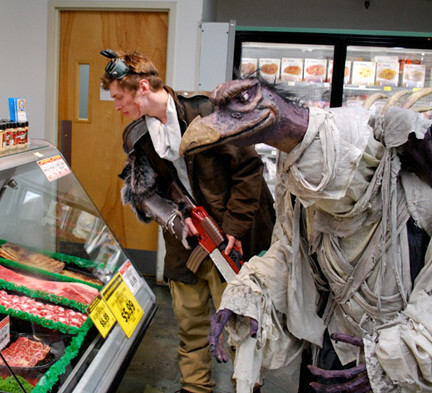 Here’s a slide show of monsters and cartoon characters chilling in the seafood section and rolling down the aisles.